Dodgers Blue Heaven: Welcome to the Blue, Tom Koehler! Koehler, 31, was non-tendered by Toronto, which acquired him from Miami in August. Koehler was 0-2 with a 2.65 ERA in 15 games (14 in relief) with the Blue Jays after going 1-5 with a 7.92 ERA in 12 starts with the Marlins. As a converted starter, Koehler would fit the multi-inning reliever role the Dodgers rely on with most of their starting pitchers lasting barely five innings per game. "As teams are trying to maximize roster spots, I think it's going to become more common," general manager Farhan Zaidi said of the multi-inning reliever during this week's Winter Meetings. Koehler had been almost exclusively a starting pitcher until the trade. At the Meetings, Zaidi said the club continues to be intrigued by starters whose stuff "plays up" when they are moved to the bullpen and can shed the mindset some starters have of pacing themselves. "It's proven over and over, guys' stuff plays up and guys have success going from one role to the other," said Zaidi. "It can give guys a second career." Via Eric Stephen at True Blue LA; "Dodgers reportedly sign Tom Koehler to 1-year deal." 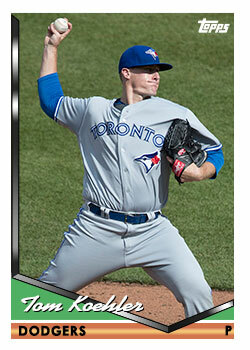 After a 7.42 ERA in 13 starts, the Blue Jays shortly after acquiring him in late August shifted him to the bullpen. 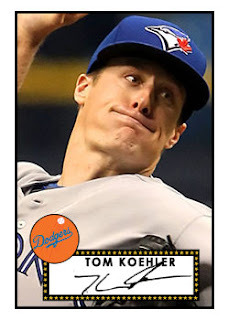 In 14 relief appearances with Toronto Koehler had a 3.00 ERA with 11 strikeouts in 12 innings. In relief Koehler’s strikeout rate jumped from 18% to 21.6%, and per Brooks Baseball his average fastball increased from 93.03 mph to 94.05 mph. Another big bullpen difference for Koehler was his curveball, thrown a third of the time in relief compared to 19.45% as a starter. Via Ron Cervenka at Think Blue LA; "Dodgers hoping to catch lightning in a bottle with Tom Koehler." Via Chad Moriyama at Dodgers Digest; "Tom Koehler reportedly signs 1-year deal with Dodgers, provides an intriguing relief option." This signing is obviously a hope that we can once again find unrealized talent. In other words, we are hoping mightily that Tom Koehler will be our new Brandon Morrow. In honor of his signing with the club, I made the above two fantasy Baseball cards of him seen above.